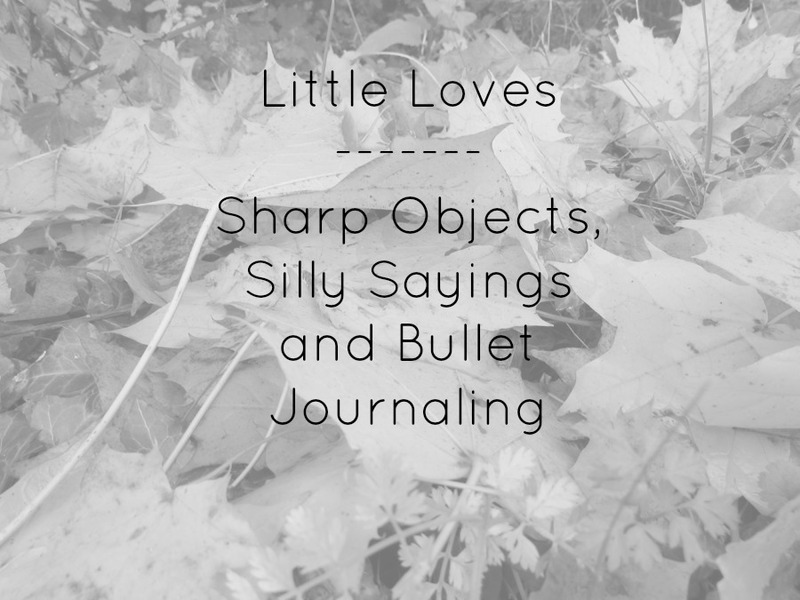 Little Loves is a weekly linky hosted by Morgana of Coffee, Work, Sleep, Repeat - the idea behind the Little Loves linky is being able to recall and record the little things that have made your week. As I've mentioned a number of times this month, I am working through the works of Roald Dahl in September. It's looking like I won't be completing all the books on my original TBR, but I'm not too fussed about that as the objective wasn't too read all the books, but to immerse myself in the writing of my favourite childhood author during his birthday month. This week I have also started Sharp Objects by Gillian Flynn in preparation for September's #BookClub140 chat. I've read Gone Girl by the same author, and have been intrigued by her other works since then. As per, I'm still watching episodes of Gilmore Girls... I've quite a way to go before my re-watch is complete, so I think you'll be hearing about that show for a while. Very much enjoying it though. This week I did watch a movie, another re-watch, and that was The Woman in Black. I have read the book (multiple times), seen the play in the West End (twice), and also watched the film adaptation - this ghost story is one of my all time favourites. I was totally creeped out whilst re-watching the film, and despite me having to take breaks during watching (because I was that scared), I thoroughly enjoyed the re-watch. 'Don't be silly, mummy' - toddler in response to me asking him if he was cold. That's the first time he has said that. I've heard it plenty of times since! Alexander has also been saying 'Oh, the indignity' a lot, thanks to Gordon from Thomas the Tank Engine. He is picking up on so many little sayings now, and using them at random, but often appropriate, times in the day. I spruced up my Pinterest this week, with new boards and a good old reorganise - I do love reorganising things. I also created a bullet journal board, which provided a bunch of inspiration for drafting my October spread. I feel like I'm at a place now with my bullet journal that I know what works for me, what doesn't, what I want to record and the way in which I want to record it. There has been some trial and error, but I'm really happy progressing forward. Cosy, but light, layers - autumn is here; hooray!! Autumn is officially here now, and whilst I'm not complaining about the weather, we have yet to experience that crisp autumn air that I love so much. It isn't exactly hot here in the valleys now, but it isn't chilly autumn either - a happy medium. I could be a little bit crazy, but I've made the decision to blog every single day in October on my book blog - Reading With Jade. I know blogging every day is the norm for some, but most definitely not me, so whilst it's going to be quite the commitment, I'm super excited about challenging myself in this way. Oh the indignity! - My daughter went through a phase of saying that too! Bullet journaling is such fun, isn't it?! I use a squared Moleskine currently, but have heard a lot of good things about the Leuchtturm1917 - I think I'm going to do a little research on it, as I may make the switch in the new year. I do quite like the Moleskine though! I've just bought a bullet journal, so I'll have to find your board and have a follow. It's all new to me! Good luck on blogging every day in October. I've blogged every day for a month when I first started my previous blog and found it a great experience but really tough! Haha! Bullet journaling can be quite overwhelming to begin with, there is so much information and inspiration out there! Thank you! I imagine I'm going to find blogging every day quite tough too - I am looking forward to it though. Haha - that they are! Ah, maybe the new year would be a good time to start bullet journaling. I think it can all appear quite overwhelming to begin with, but having a personalised system for you is great! Thanks! I'm actually sharing my October spread on my book blog next month. I know you're having issues with Sharp Objects - I finished it just this morning, but it did take me a while to get in to it. I think the writing style was quite unexpected, having read Gone Girl, and the main character wasn't the easiest to fall in line with. Giving it three stars overall. The new year would be perfect timing to give bullet journaling a try... My handwriting is terrible, but practice makes perfect! I think Pinterest boards can easily get out of control, and whilst it can take a while to clean up, it is well worth it.